Bike-sharing app company Spinlister is teaming up with Dutch urban bike maker Van Moof to create a hire bike scheme it says will take the traditional Boris Bike-style hire bike system and "turn it on its head". Instead of hiring bikes owned by municipalities from central locations, bikes on Spinlister's system will be owned by individuals and can be scattered around a town so they're in useful locations, It's less like Boris Bikes and more like Zip Car. Spinlister is a service based around a smartphone app that allows you find a bike to rent if you're in an unfamiliar town, to offer up a bike for rent if you've a spare usually gathering dust. It's a nice community-spirited idea, but it's hard to get involved as a renter if you don't have a suitable bike. 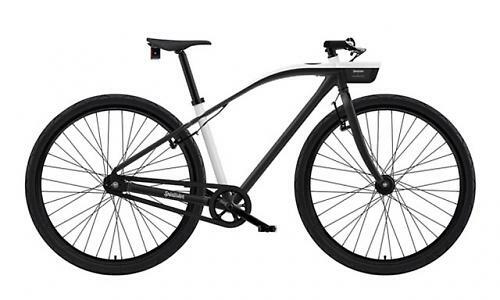 To solve that problem, and take the idea up a level, in late summer 2015, Spinlister will start shipping a bike from Van Moof that's specifically designed for the job, with built-in technology that allow it to be left anywhere, ready for hire. The new bikes, which took six months to develop, will initially be rolled out in Portland, Oregon, creating the city’s first working bike-share program. Spinlister users will own the bikes and make them available to rent via the Spinlister website and app. The idea is that there will be no traditional hub or station where bicycles are available or have to be returned. Instead, users are able to decentralize the bicycles throughout the city’s network of existing bicycle parking locations. Within the Spinlister app, potential renters will be able to see nearby available bicycles, so there;s no need for back-and-forth communication with owners, or having to plan trips around traditional fixed-location bicycle hub stations. The Spinlister VanMoof bikes will have technology built in to support support the decentralised hire bike idea, including an integrated Bluetooth lock that allows the bikes to be locked and unlocked anywhere. A computer integrated into the frame automatically updates the bike's location on the Spinlister web and mobile app once a rental is complete. Other bike features include wireless antitheft tracking, tamperproof nuts, easily adjustable seatpost, and integrated dynamo lighting. That frame is made from aluminium and puncture-resistant tyres should keep it moving. The users will own the bikes, but Spinlister plans to subsidize and finance them allowing users to pay for the bikes through rental revenue over time. Spinlister says this eliminates risk for the listers (bike owners) while creating a profitable revenue stream for them. “This new decentralized bike-share model will take the traditional system of a central hub or station, and turn it on its head,” says Spinlister CMO, Andrew Batey. "From a renter’s perspective, they can simply use the Spinlister app to locate a bike, book it, unlock it and ride away. From an owner’s perspective, they’re able to conveniently make money, help people, and participate in the world’s first sustainable bike share model. Find out more about Spinlister at its website.